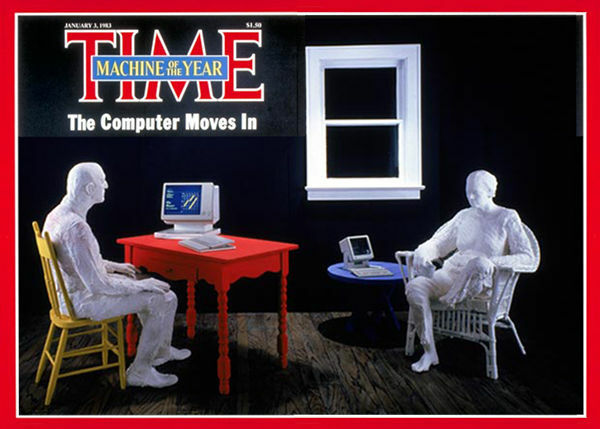 Feature Thirty years ago, Time Magazine broke its 86-year tradition of naming a Man of the Year, and instead anointed its first Machine of the Year: The Computer. Time didn't deliver this news via www.time.com nor an HTML-encrusted email blast, but rather by macerated wood pulp pressed into sheets and coated with ink, cut into rectangles and stapled together, then arduously trucked, hauled, or flown to subscribers and newsstands. Magazines, that is: one of 1983's prime communications vehicles. Time's January 3, 1983 issue actually bestowed its annual honor not broadly on The Computer per se, but rather on the personal computer, the device we all now use as part of our workaday world, but back then was the mysterious "television typewriter" that was only beginning to come into its own. As the premier US weekly news magazine's awardee, the personal computer was in exalted company: Time had previously awarded its annual honor to figures as diverse as Adolf Hitler and Lech Wałęsa, raising onto its editorial pedestal not necessarily the most admirable personage of the previous year, but the one who had most changed history. In hindsight, it's easy to argue that although the PC has clearly not been as horrifically history-changing as Herr Hitler, it has however done far more to influence world affairs than Pan Wałęsa – and I write that as a proud descendant of the Polish working class that Wałęsa served so admirably. It may be hard – or impossible if you're under 50 – to remember the days when PCs were just barely breaking into the mainstream. You may find it even harder to remember the influence that magazines had in that pre-internet, pre–"Let a Squillion Online Publications Bloom" era. Time mattered. Its editorial decisions mattered. And mattering – along with, frankly, nattering – wasn't limited to mass-market news rags such as Time. When Time declared the PC to be Machine of the Year, computer magazines also mattered, nattered, and flourished, hauling in advertising hand over fist, ordaining winning products, and damning losers into the discount bins of the swap meets of yesteryear. It was a heady time. In the years following Time's award, the PC's fortunes waxed and computer magazines' fortunes waned. Some of you Reg readers may remember those days; most won't. But I wager that all of you might enjoy a wee bit of a jaunt back in time to revisit how magazines covered the PC's early days – and, sadly, how most of those rags either died out or faded into shadows of their former selves. And so, hoping to both amuse and instruct, I ensconced myself in the main branch of the San Francisco Public Library, requested a stack of volumes to be pulled out of lonely storage, thumbed through them while decades of dust fouled my respiratory system, scanned and heavily Photoshopped selected pages, and slapped together the following. Enjoy. And don't forget to click on the thumbnail images on the left of each page. Many have some great reading or admirable images – and marvelous hairstyles – that will either remind you of where you've been or explain the era during which those IT dinos around you cut their teeth.